During their 400-million-year reign, sharks have faced environmental pressures similar to those confronting all species -- they must acquire food, escape predators, find mating partners and ensure the survival of their offspring. In addition to these historical pressures, modern sharks must also contend with the relatively new environmental pressures created by humans, including polluted waters, changing climates and unsustainable fishing practices. The ancestors of modern sharks appeared long before the first dinosaur walked the planet, and it did not take the lineage long to evolve a very successful suite of adaptations to survive in their environment -- most of which, modern sharks still possess. Streamlined bodies, cartilaginous frames and advanced sensory systems have helped sharks to become incredible predators. While some of the larger species enjoy an existence that is largely predator-free, most shark species are small, and must use speed and agility to out maneuver predators. Additionally, many small species -- and the young of large species -- tend to select predator-free habitats, such as lagoons and estuaries. Run-off water contaminates near-shore waters with pesticides, fertilizers and sediments. These pollutants are very destructive to sea-grass habitats, reefs and estuaries -- habitats that many sharks use as nurseries for their young. Additionally, some species -- notably tiger sharks (Galeocerdo cuvier) and bull sharks (Carcharhinus leucas) -- prowl these habitats for prey. Bioaccumulation -- the tendency for animals of high trophic levels to accumulate dietary toxins -- has a strong effect on sharks. Sharks often have high levels of heavy metals -- particularly mercury -- in their tissues, which may prove detrimental to their health. Along with that of the Earth’s atmosphere, the temperatures of the ocean are rising. While a small fluctuation in temperatures may not affect sharks directly, it's very likely to cause the collapse of portions of the food web. In addition to, and perhaps more detrimental than, the rise in temperature, the carbon dioxide levels of the ocean have risen dramatically. This increase in CO2 is profoundly changing ocean chemistry, most notably by lowering the water's pH levels. This acidification slows the formation of mollusk shells, slows or eliminates the growth of coral and can even make fish unable to detect prey via their sense of smell. According to the Pew Environment Group, as many as 100 million sharks may die each year from fishing activities, many of which represent incidental by-catch. Humans are also harvesting the sharks' prey at an unsustainable rate. Because many sharks are at the top of the food chain, they are dependent on organisms of many different levels in the food chain -- including those species targeted by humans. Additionally, low populations make it difficult for sharks to find suitable mates. While this may not pose a problem for species that form dense colonies, those species that occur at low densities may have trouble finding mates in the vast ocean. While environment pressures affect sharks, the opposite is equally true. 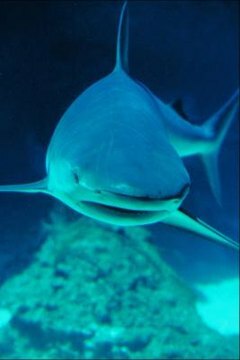 In 2013, a team of ichthyologists from the Australian Institute of Marine Science and the University of Toronto studied the effects of shark population decline on the coral reefs off the northwest Australian coast. Scientists found that declining shark populations correlated with a decline in the herbivorous fish species that inhabit the reefs. With their population unchecked by sharks, mid-level predators consume more of the reefs' herbivores, which are important for keeping algae levels in check.